This pump is a new stainless stee multiusage Vacuumpump with water circulation.It has big power,and multipe air exhaustor.and fixed,insideontside water circulation,can be with five tap for suction direct display at the same time,The pump has the advantages of unuse oil,non-pollution,big power,lower noise,easy movement, save waterelectricity one machine with multi-usage. exhaustor are fixedused independently or parallelly. 2Corrosion resisting,The outer cover is of stainless steel. 3The pump body,Vane wheelwater distributor are made of staintess steel. This Pump is of jet pump with circulating water asworking liquiddesigned by negative pressure produced from spraying liqunid .It is ar new vacuumair pump, which can provide with circulating cooling water to the reaction of device at same time. The pump has the advantages lf unuse oil,non-pollrtion corrosion resisting, lower noiseeasy movement, one machine with multi-usage. 1One machine with multi-pipe operation, Where three sets of air exhaustor are fixedused independently or parallelly. 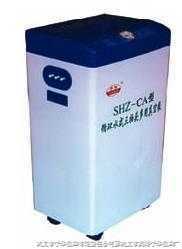 3Non-pollution,The pump body is made of polyvinyl chloride pvcplastics,and the onter cover is of cold-rolled steel plate with backing finish.